When visiting Kevin’s family in upstate New York, his aunt gave us a lovely farm fresh head of green cabbage. I don’t usually buy whole heads of cabbage. If you have a standard RV fridge, you’ll understand why. Sure, you can get one. But then you’ll have room for nothing else. So I immediately got to work thinking about how we were going to eat it. Then I remembered Cabbage Crunch Salad. If you’ve never had it, it’s an old school potluck dish. It’s pretty easy to make and always a crowd pleaser. I had a recipe for it, but it seemed too oily for my taste. And too sweet. And it needed more color and veggies. I originally planned to serve this as a side to burgers or sandwiches but decided to make it a meal by adding diced vegan chicken tenders. That turned out to be a perfect idea! But it’s also great as a side. Yes, the chicken tenders got a little extra done on the grill. It happens. After we’d already eaten half our lunch, Kevin remembered we had a bit of coconut bacon in the cabinet. If you have some, I highly recommend that addition. Again, it’s not required, but delicious. A few other additions that might be interesting: red bell pepper strips, cucumber matchsticks, or sriracha for a bit of heat. I purposefully pushed this recipe towards Asian flavors with the sesame oil and rice vinegar. You could easily substitute more olive oil for the sesame oil and white wine or cider vinegar for the rice vinegar to move the flavor profile away from Asian. This cabbage crunch salad, without the chicken, will hold up nicely at room temperature for a while, which makes it a solid potluck choice. It gets better if it sits at room temperature for a while. It gives the cabbage the opportunity to soften a bit and the flavors a chance to develop. A nice side without the chicken or meal with it. It's also a potluck pleaser. Toast the sesame seeds and almonds together in a dry skillet over medium heat until fragrant and they begin to brown slightly. Before you open the ramen package, lay it on a hard surface and smash the noodles with the heel of your hand. Keep doing until it feels like they're all broken up. Combine all dressing ingredients in a small bowl and whisk together until combined. Combine all non-dressing ingredients in a large bowl. Pour dressing over the top and mix thoroughly to coat. While salad rests, cook vegan chicken tenders as directed on package. 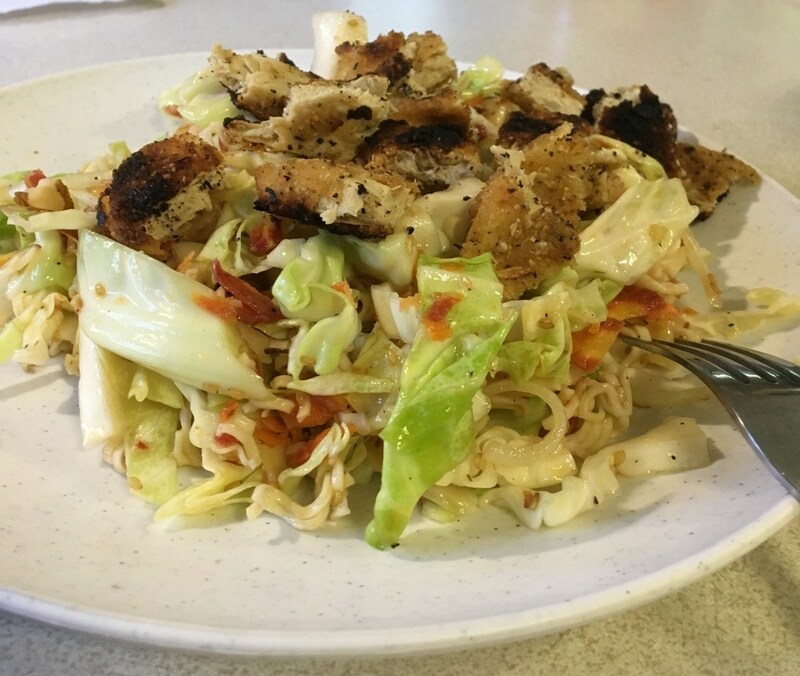 To serve, pile plate with the cabbage salad, top with sliced chicken tenders and coconut bacon, if using. Vegan ramen can be found in health food stores and the natural foods section of some grocery stores. You'll want a simple flavor like garlic, chicken, mushroom, etc. Note: the nutritional information provided is created using an online calculator. It is only meant to be a rough guideline. For best results, calculate the nutritional information yourself with the exact ingredients and amounts that you use. Nutritional information for this recipe does not include ramen noodles or seasoning. It keeps well and makes great leftovers too.